FCU English Online: FCU Fiftieth Anniversary Celebration ! FCU Fiftieth Anniversary Celebration ! Recently, when you were walking on campus, you might have seen posters announcing a series of activities to celebrate Feng Chia University’s fiftieth anniversary. 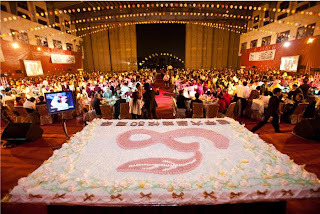 The most important and largest of these activities was hosted on November eleventh, Feng Chia University‘s birthday. The major celebration events included the Homecoming, the tug of war contest and the anniversary banquet. The Homecoming activities started at 9 o’clock between the Recreation Building and the lawn. There were many stalls selling exotic and local cuisine from around Taiwan, promoting a green campus, and selling many kinds of goods for the charity. These stalls attracted not only students and alumni but also many of the people residing in the surrounding neighborhoods. 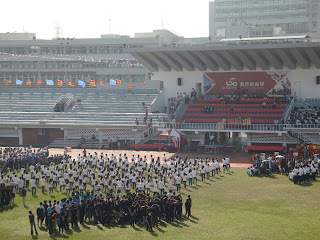 The final round of the tug of war was the most exciting event among all of the celebration’s activities. 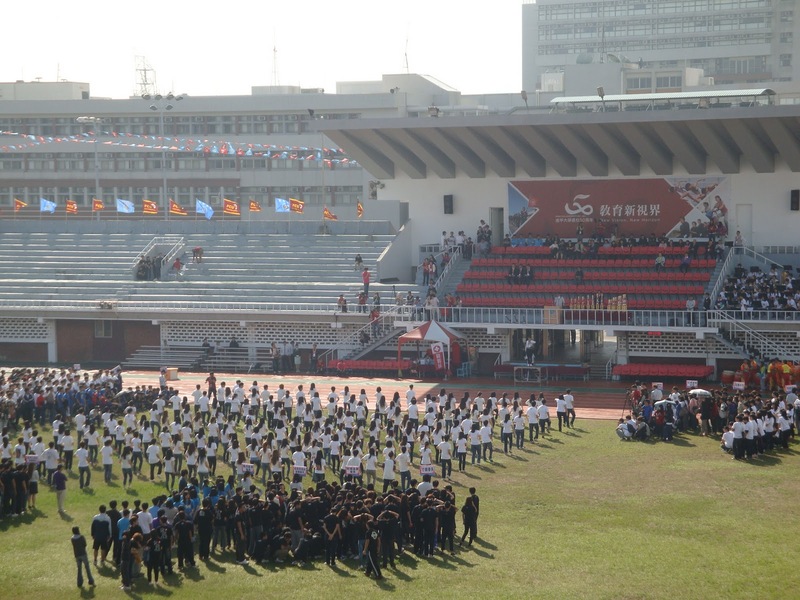 Feng Chia University’s tug of war competition has been held for over 40 years. The tug of war is not only a meaningful sport but also stands for the close relationship between the students and Feng Chia University. The tug of war competition started at 11 a.m. Many people flocked together at the playground when the tug of war was about to begin. When the judge gave the signal to start, both teams did their best to win the competition. The audience cheered the team they liked best; everyone felt nervous and excited about the competition. Finally, the champion of the tug of war was the team from the Water Resources Engineering and Conservation Department, and the second place team represented the Mechanical and Computer-Aided Engineering Department. The Anniversary Banquet started at 6:30 p.m. in the new Shui-Nan campus. This banquet brought together alumni from around the world. In addition to celebrating Feng Chia University’s fiftieth anniversary, they raised funds for new school buildings. The alumni care about the future development of the school and are enthusiastic about school affairs; therefore, they did their best to help. These Homecoming activities were lots of fun, and they strengthened the relationships between students, alumni, and the people living in surrounding neighborhoods – the entire Feng Chia University community.